Don’t even get me started on the insane and probably very irrational feelings I have about our baby turning one in just 4 weeks. 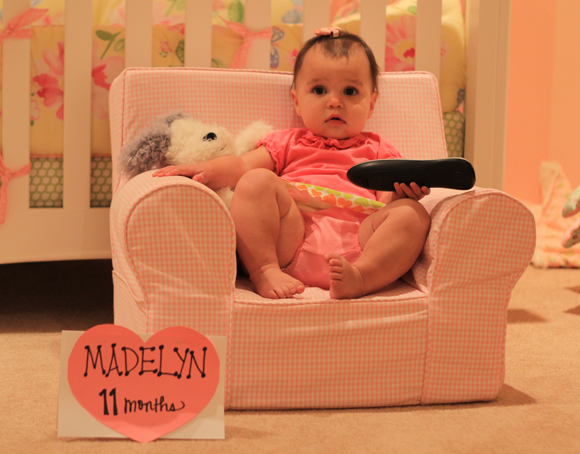 Yesterday, July 9th, Madelyn turned 11 months and I can’t believe we are pushing the 12 month mark. This year has been the fastest and most eye opening year of. my. life. Okay, okay, hold it together, Friedman! We’re not there yet. We’re just on 11. Deep breaths. Madelyn just gets more and more fun! Watching her learn and take in the world around her is fascinating to me. I think all parents say this and I just can’t believe I’m one of them. Her personality is sinking in more and more each day and I can literally see the synapses in her brain taking place every moment I’m with her. She’s even gotten too smart for hair bows and rips them off when she senses them on her head. How is she my child?? flew like a champ to Seattle for a family vacation! She had her first taxi ride (ask me what it’s like to ride in the backseat of a taxi on the free with a 10-month-old infant on your lap. I would answer, “bizarre.” She is such a good traveler! We are so lucky we can take her places. Hey, she’s born Friedman — always on go, go, go! More on Seattle soon! pretty much eats anything! We share what’s on our plates with her, and she doesn’t seem to be too picky (seriously, how is she my daughter? Pulling out bows? Eating anything? Who is she? Is this a dream?). This month, she ate a lot of small chicken pieces (chickie), tons of blueberries, handfuls of strawberries, she’s a big fan of melons (so is Bryan. nyuk nyuk nyuk), enjoys meatballs, likes cucumbers, and loves pasta and bread (Carbs! THERE’S my daughter!). went on a few more auditions, but nothing booked! Old Navy and Garanimals had other things planned apparently. Like less cute kids or something. Whatever. No hard feelings. I’m just putting out a campaign to boycott those brands, but really, it’s fine. We’ll just keep going for the fun of it! sprouted one more tooth and I didn’t even notice she was teething until it was in and out for the world to see. We are so lucky that she teethes so easily. No fever, no moodiness, no pain. One day: gum. The next day: pearly white. I’m so glad for her that she doesn’t seem to be uncomfortable during what seems like should be an uncomfortable experience. has favorite toys that are not made by Fisher Price or Mattel. Madelyn is — two words — ob. sesssed. with our TV remotes and our iPhones. 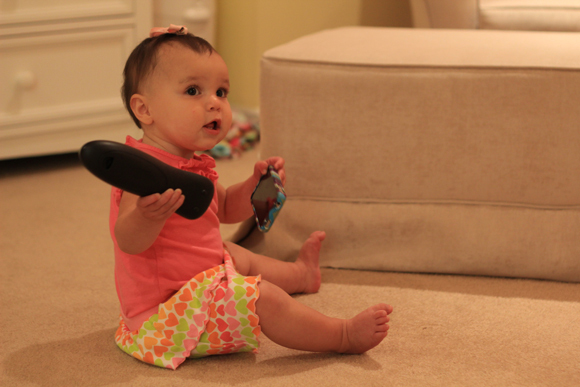 I think all babies are, but I still can’t manage to wrap my head around the fact that a singing “cell phone” with flashing lights and oogly eyes is less exciting than a locked iPhone 4. Not even a 4S. Madelyn, raise your standards and at least lust over a phone with Siri. Her only excuse for obsessing over my phone is that maybe she has eyes for my Jonathan Adler case. If that’s the case, brava. If not, well, I don’t get it. 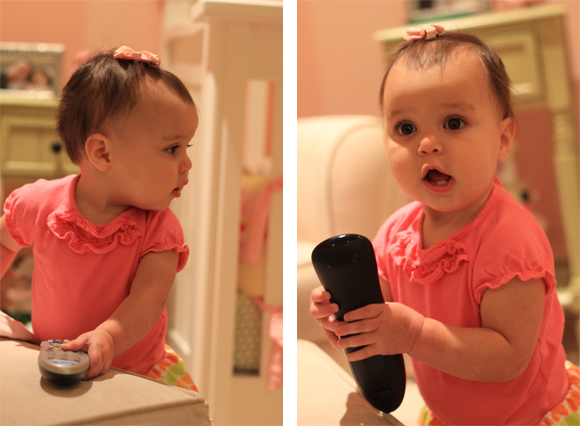 Babies are so weird. She’s just one crotch grab away from Al Bundy. Can we watch Real Housebabies of Ventura County? 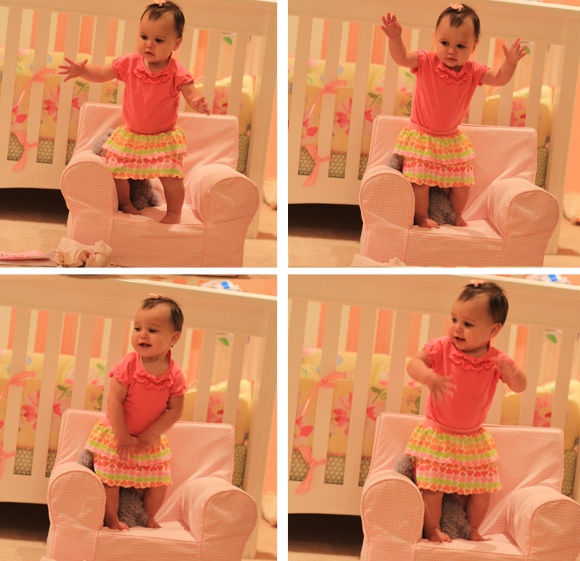 And that’s 11 months as recapped by a fairly sane and composed mother. Next month’s recap? Yeah, don’t count on it. She is so cute and happy I wish I could meet her! The blog is beautiful by the way!